When it comes to running power in your home, you need an experienced, master electrician to ensure the wiring is done correctly and up to code. From troubleshooting power problems to basement wiring and standby generators, Besst Electric is the name SE Michigan homeowners trust most. Are your lights flickering? Have you recently bought a new appliance? Is water leaking in from your electrical panel? If you answered "Yes" to any of the above questions, you may need to upgrade your electrical panel. We give you the power you need, where you need it! Never be without power again! It seems like power outages are happening now more than ever. With a standby generator, you can keep the lights on, the fridge running and the house a comfortable temperature. This is one investment that truly pays off. Besst Electric is a local, family owned and operated, residential and commercial electrical contracting company serving Oakland and Macomb counties for more than 40 years. Owner and operator, Brad Shaeffer, is a second generation licensed contractor and master electrician providing expert electrical repairs, maintenance, upgrades and installations for homeowners and businesses alike. As Macomb, MI's preferred electrician, Brad goes above and beyond to ensure his customers understand exactly what needs to be done and find value in the service his company provides. With Besst Electric, you're assured honest and upfront estimates. We also work with the city to obtain any necessary permits or inspections, and you will be informed every step of the way. At some point, every homeowner needs an electrician. Whether you've just purchased a new appliance, hot tub or electric fireplace; are adding on or remodeling your basement; or just need more power, you'll want to hire the best electrician possible. Besst Electric in Macomb, MI is a full service electrical company that is licensed and insured. 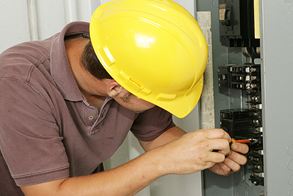 We offer reasonable rates for quality electrical service you and your family can depend on. With Besst Electric, you work directly with the owner, a resident of Macomb, MI. You'll get a quality project, completed properly and up to code. We don't cut corners and we always ensure your complete satisfaction. We want to earn your trust and your referral!